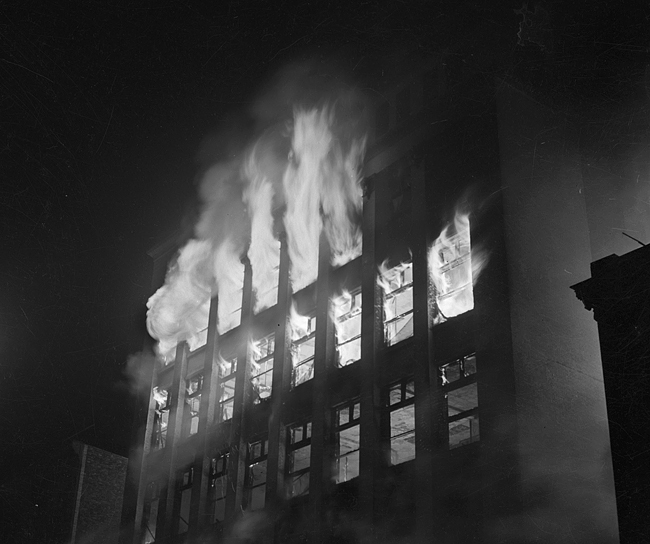 Fire caused by a lightning bolt destroyed the John Bressmer Co. department store in downtown Springfield early on May 2, 1948. First reports estimated damages of $2 million. Even though that figure was later adjusted downward to about $1.3 million, the Bressmer’s blaze, adjusted for inflation, remains the most costly ever in Springfield. No one was injured in the fire. Night watchman Charles Wendling, the only person in the building, sounded the fire alarm about 2:15 a.m. However, firefighters with Springfield Fire Department Engine No. 1, which had been out on another call, saw the glow of the flames even before the alarm came in and were at the scene seconds later. Eventually, 84 of the city’s 86 firefighters (the other two were out of town on vacation) turned out to battle the blaze. They couldn’t save the Bressmer’s building – Fire Chief Francis Londrigan said later he believed the lightning bolt set all seven floors on fire instantaneously — but they did limit damage to surrounding businesses. The lightning that hit Bressmer’s was part of a severe thunderstorm that struck Springfield the night of May 1-2, 1948. Lightning strikes started fires in at least two homes about the same time as the Bressmer’s fire began. Engine 1, in fact, was on its way back from a small lightning fire on South Sixth Street when firefighters spotted the Bressmer’s blaze. A $2,000,000 fire, the most destructive in the history of Springfield, completely gutted the John W. Bressmer Co. department store early yesterday morning after a bolt of lightning apparently struck an elevator shaft. The blaze broke out during a heavy electrical storm and was discovered by Charles Wendling, a night watchman, at 2:15 a.m. as he was making his rounds. The watchman said he was on the mezzanine floor when he heard a crackling noise. He opened the elevator door and found the shaft full of smoke. Spectators interviewed in an on-the-spot broadcast by Myron Walden, WTAX announcer, who arrived on the scene about 2:30 a.m., described the huge billows of smoke rising into the sky “as just like the pictures of the atom blast at Bikini.” The interview was transcribed on a wire recorder kept ready for such emergencies and rebroadcast four times yesterday. Six adjoining businesses – Roland’s and Westenberger’s department stores, Collins’ and Tobin’s jewelry stores, and a Singer sewing machine store, along with the Sangamo Hotel – suffered only minor damage. Bressmer’s reopened in temporary quarters across the street at 629 E. Adams St. in July. However, the number of employees was only 50 to 90 people, compared to 225 in the old store. Bressmer’s also moved quickly to rebuild in its former location. In August, officials announced that the ornamental cast-iron front of the old store remained solid, and the new Bressmer’s would have the same general design. The rebuilt store opened on Nov. 29, 1949. 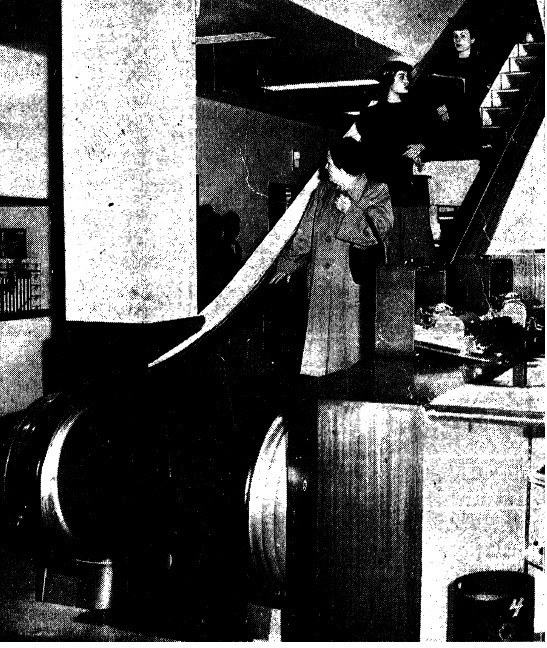 Among its innovations were “the Sangamon Valley’s first electric stairway” – now known as an escalator – and overhead fluorescent lighting throughout the store. The Bressmer’s store – by then owned by Stix, Baer & Fuller – closed in 1980. The American Institute for Economic Research estimates that $1.3 million in 1948 was the equivalent of about $13 million today. The Bressmer’s address given in the May 3, 1948, page 1 story is wrong. The store was at 612 E. Adams St., not 613. This entry was posted in Buildings, Business, Department stores, Fires. Bookmark the permalink. Reading your article on the Bressmer fire brought back lots of memories. My mother worked there, and my father worked for CIPS, right across the street. We spent that day in the Illinois building, watching the Bressmer building burn, and I have home movies of it, as well as many stories of the aftermath and reopening on the corner of 7th and Adams. If you do any kind of audio histories, I would be glad to talk to someone, and also share the movies. Ms. Quinlan: As it happens, I’m trying to create a SangamonLink podcast, but I’m struggling a little with technical issues. Your memories (and maybe your movies) could be a great resource for that. Thanks very much for the offer. I’ll email you privately to follow up.